Jlab is renowned OT Equipment Manufacturer, OT Equipment Suppliers, OT Equipment Exporter, Hospital Surgical Equipments, OT Equipment India. Our company is one amongst the noted manufacturer and exporters of Operation Theatre instrumentation. The broad range of our enterprise includes transportable physiological condition equipment, Minor physiological condition equipment and many more. 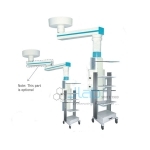 Our OT equipment is Manufactured using premium grade raw materials and used for numerous surgeries. Salient properties of our complete assortment area unit elegant design, exactitude performance and affordable prices. Our all surgical and diagnostic instruments are manufactured strictly as per the set guidelines of healthcare. Cross Arm and Control box are molded from High strength Aluminum and the Surface is oxidized for durability. Cross Arm's rotation and height adjustment are controlled by imported electric motor. Rotation is flexible and free.